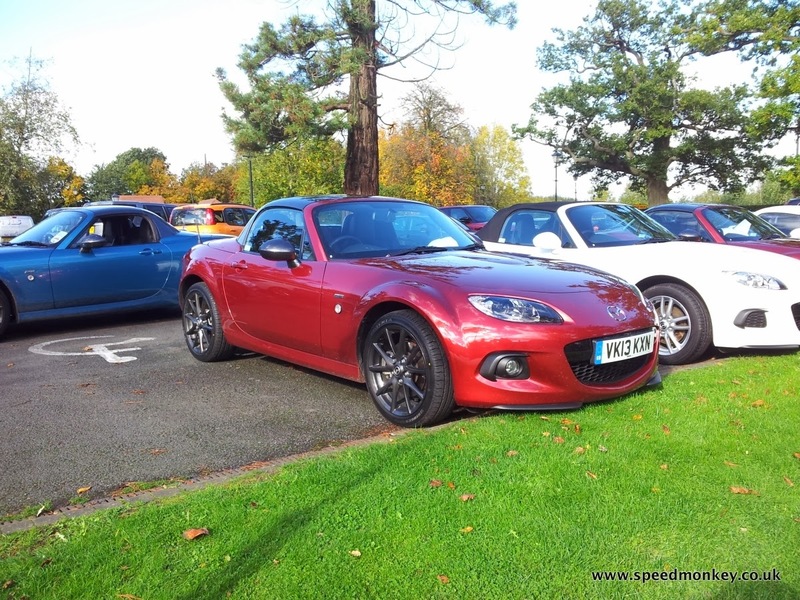 I’ll put my hand up and admit I’ve never driven an MX5 before (or an Alfa for that!) although I once had 10 minutes behind the wheel of a 1990 Eunos Roadster which is effectively the same car unofficially imported from Japan. That was a bad experience as it leaked, was slow, noisy and looked pretty bad with some chrome extras and standard fit rust. 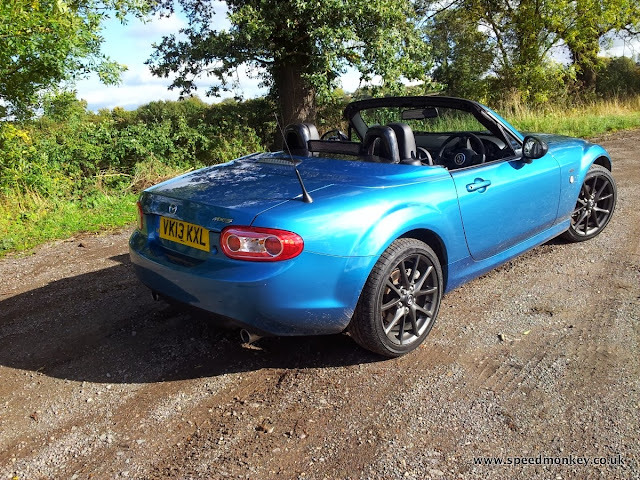 So my previous experience of what is the closest to the MX5 had left me with a sour taste, but over the years Mazda has improved the looks, the build quality and drivetrain and only last year I considered buying a Mk 2 version as a summer runabout. 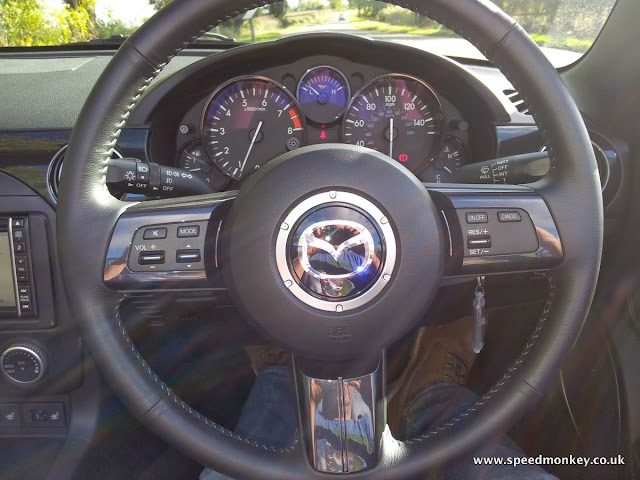 The Mazda MX5 has a simple recipe of front engine combined with rear wheel drive, lightweight and strictly a two seater but with a pokey engine, just fast enough to be entertaining but also cheap to run. Its party trick is the presence of a limited slip diff which means all the power the little engine develops can be put directly on the road. It’s the closest thing to a modern day Lotus Elan. The third generation is what I’m driving today. It was first launched in 2005 and is a more grown up affair than previous models with an optional hard folding roof, a 2 litre engine and more attention paid to NVH (Noise, Vibration and Harshness) so stood up better next to more expensive rivals such as the Mercedes SLK, BMW Z4 and Audi TT. This isn’t a very manly class but more of that later on. Today’s car is the 2013 mildly face lifted model fitted with a 2 litre 16 valve engine good for 157 bhp but as with these high revving units it’s down on torque and rated as 137 lb/ft but hopefully the kerb weight of just under 1250 kilos will keep the party going. It’s the Sport Graphite Edition which comes with 17’ gunmetal alloys, black leather seats with grey stitching, a grey folding roof and black headlight inserts. 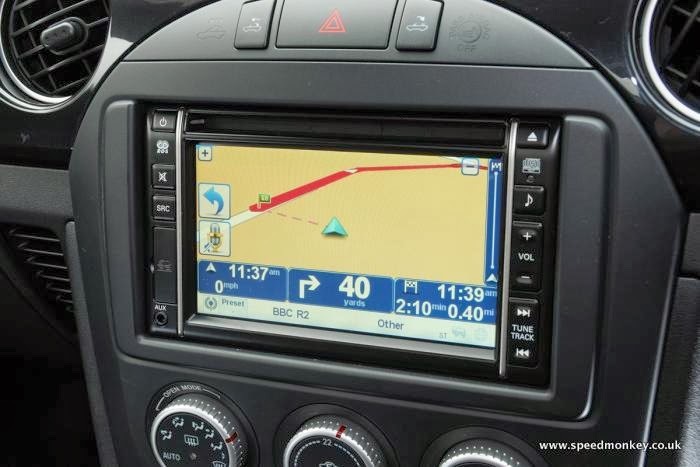 It’s very well equipped as standard with the usual electric everything but also comes with climate control and an integrated Tom Tom Sat Nav. 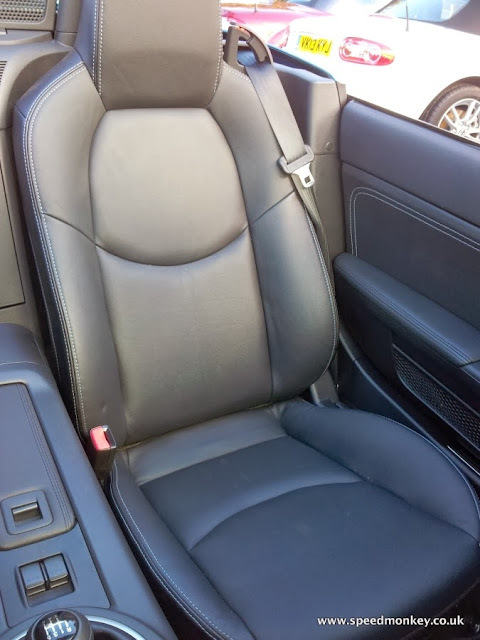 When you get in the car you almost fall into the very low set driver’s seat which sets the mood for your driving experience, that along with the nicely judged thin rimmed leather steering wheel and proper handbrake. Initial impressions are that the interior plastics and some controls are still stuck in the 1990s and wouldn’t look out of place in a Micra from that period. I open the glovebox to reveal some multicoloured wires for connecting various listening devises that look like they have been left there by a Halfords installer, not a good look. This is a special edition and is number 497 out of 500 and is celebrated by a very cheap looking sticker on the top of the dash. Of particular mention is the auxiliary charger which looks very much like an afterthought. How this was signed off on in 2005 and still today is beyond me. So start the car with a conventional key and the little motor zings to life and settles to a high idle until the engine warms. While I’m waiting for the fluids to circulate I pop the 2 mechanical catches near the top of the windscreen and press the power hood button to lower the roof faster than any other hard folding roof car on the market, in something like 12 seconds. The roof, incidentally, is made from a composite material so keeps weight down but retains the feel of a hard top when up. I put the very light clutch in and grab the gear lever which sits perfectly at hand low down on the high centre console and is more a shaft than knob so you end up holding it between thumb and fingers like you would a joystick rather than the conventional hand on top. 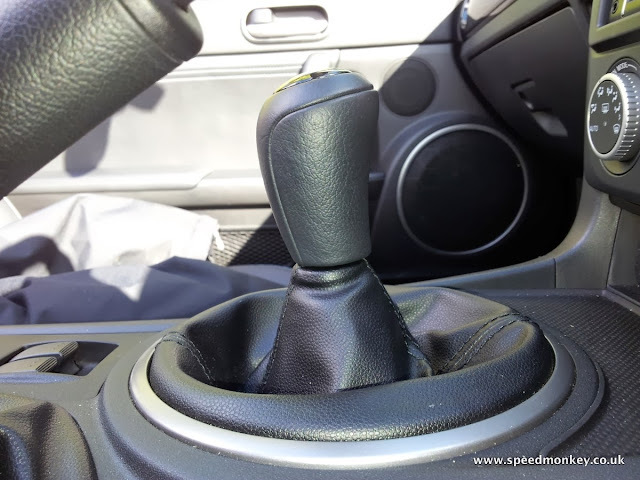 Release the proper handbrake and give the throttle a tickle and it picks up speed fairly slowly, you soon release that it’s not a massive car, more 4/5 the size of something like an 3 box saloon so it’s very easy to place on the road which means you can position the car more confidently. The engine isn’t massively powerful so you have to make the most of what’s there, keeping the revs up to maintain speed and holding said speed in the corners. And in the corners is where it shines. This 21st century interpretation of the Elan is absolutely spot on in the twists. The chassis balance is split equally over the axles at 50/50 and the grip levels are high from the standard fit 205 section Bridgestone Potenza RE0050’s. The steering is thankfully hydraulically assisted and as a consequence is brimming with feedback, not just from the road surface but the wheel direction and pitch. The body is very stiff and has been fitted with reinforcing brackets for the hard topped version so there’s very little if any chassis shake helped by the cars tiny dimensions so the front to rear gap is much smaller than say a 4 seater car which requires a much larger roof. This makes the suspension's job much easier and it’s been set up fairly stiff but well judged so not too harsh and lets a little roll occur so you can play with your line into and out of corners. I can clearly see, or should I say feel, where Mazda spent their R & D budgets and it wasn’t on the interior plastics. The engine's an odd one, a high revving screamer of a unit that feels all of its 157 horses but also it’s lack of torque and you end up using all of the revs to make progress, not necessarily for extra speed but to get the adrenalin pumping. It red lines at just over 7,000 revs which is also where it makes its peak power, but I honestly couldn’t feel the power increase over 4,500 revs where it’s just a linear delivery. Short shifting just doesn’t feel right to make progress like you can get away with in a more powerful car. The sound has been tuned by Mazda to make a little more noise than its standard road cars and whilst not crackling like a supercharged Jag it’s a buzzy/fizzy boom from the exhaust and induction in equal measures, just enough to keep it exciting but not overpowering and in keeping with the kudos of the car. The gearbox is a well judged 6 speeder and the ratios are suitably placed for use with the high revving engine keeping you in the 4-6,000 revs sweet spot and no doubt helped by that beautifully placed and actioned gear shift. After a good run around some lovely twisty and undulating Warwickshire roads I find a layby to have a good look around the car. Stepping out and staring for a while and it’s reminds me of a Honda S2000, which is a complement as it’s one of the few open topped cars associated with heterosexual males, only slightly bigger and a lot more expensive than this pint size replica. The MX is though a feminine car and if I took it back to the office the knuckle draggers in their SUVs would make comments about me being a hairdresser and using ‘product’ but those who mock obviously haven’t driven one, haven’t sampled the delicate chassis, the finessed steering and rifle bolt gearshift action. If I was in the market for a 2 seater open top sports car I would put serious thought into one of these and to hell with associated comments. The interior plastics and quality are below par for a £23,000 car but the amount of standard equipment helps justify it’s price tag. I absolutely love the integrated TomTom. It’s so intuitive along with really sensible uncomplicated mapping that I wonder why don’t all manufacturers go down this route and save themselves and the customers thousands of pounds building their own complicated systems. It’s just like your normal Tom Tom but fully integrated into the dash, fuel computer and stereo system so you have the best of both worlds. Well done Mazda, a fantastic deal that works for all. The stereo system is intuitive with a radio, CD and ipod connection and it sounds pretty good for such a small cockpit. I take a look in the boot while I’ve stopped and it’s a fair size for pretty much any shopping you are going to do but flat packed furniture is ruled out. It’s probably twice the size of the more glovebox sized boot of an F-Type and I can’t help but wonder how Jaguar messed up the boot on that car. Note, there’s no spare wheel in the MX but you could easily squeeze in 2 sets of golf bats. I then look under the bonnet and spot the motor placed far back at the rear of the engine bay to aid the 50/50 weight distribution and see the hydraulic power steering set up which will soon become destined for the history books along with the manual gearbox and ignition key. After getting sentimental over the future losses of the basis of driver enjoyment I go for another drive to revel in them whilst I still can. This time I up the game a little, pushing a little harder, revving that bit higher and the package revels with a stream of smooth (not rapid) acceleration and particularly feelsome gearchanges that feel just perfect on the straights, heavily servoed but accurate brakes toward the entrance to the corner and a balanced poised line through the corners retaining the fairly high entrance speeds. The chassis lets you squeeze every last horsepower out of the torque-lean motor and the grippy diff ensures no horses are wasted at full throttle mid corner and leaves me smiling like a Cheshire Cat. 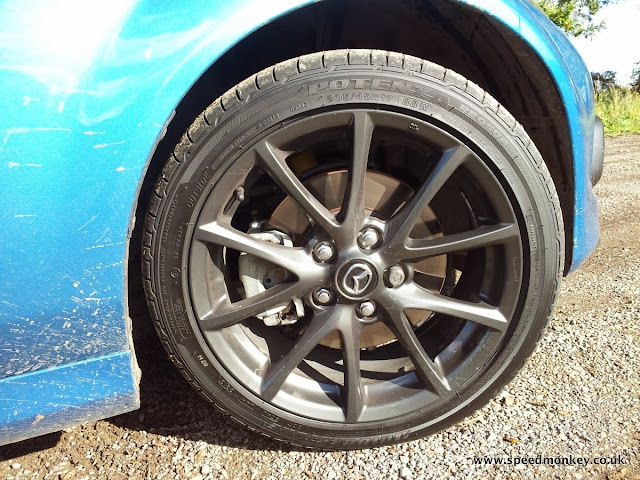 The thin rimmed wheel is a joy to use and perfectly sized to steer and excel in the feedback provided by the brilliant chassis. The MX5 is no overpowered bruiser but a ballerina on steroids, the engine's about right in terms of power, any less and it wouldn’t deliver and any more and it may actual spoil the experience by overwhelming the chassis taking it out of its short wheelbase comfort zone. The engine's everyday usable, capable of delivering 36 mpg on the combined cycle and being well behaved in traffic but with the ability to rev to over 7,000 rpm when you want to feel like your going a million miles an hour. It’ll hit sixty in 7.9 seconds and will run out of puff at 136 miles an hour which wouldn’t give a modern hot hatch a run for its money. This car's more than the sum of the performance parts, you have to take into account the fun factor it offers. I didn’t get the back end out on the public roads as the diff was keeping the 2 litre engine in check but I don’t care, perhaps it’s a good thing that you can have so much fun without getting into trouble and at law abiding speeds. The Mazda MX5 is a car than has not been overdeveloped. It still has the quintessential properties of a 20th century feelsome car in terms of raw feel and control having both a manual gearbox and hydraulic steering which shows you don’t need these new fangled technologies to have good and cheap fun yet still delivering sensible fuel economy and low emissions. 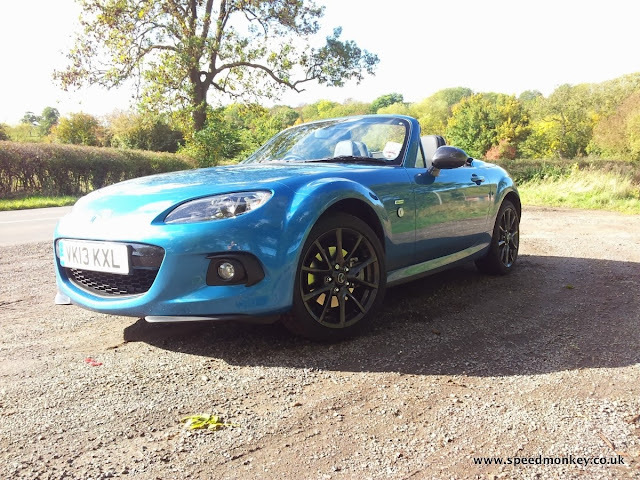 The MX5 Sport Graphite is available in Aquatic Blue Mica as tested and also in Aluminum Silver Metallic and Zeal Red Mica. The the price as tested is £22,995 which represents exceptional value for money for one of modern motorings cheap thrills with few real rivals. I leave you with 3 standout words from my drive of this vehicle – Agile, Lithe and fun!